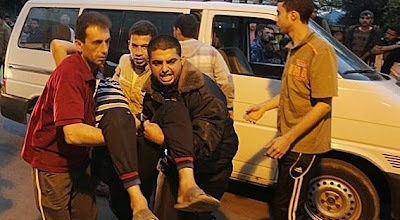 50 wounded in blast at Gaza training camp | May. 14, 2015 | 10:53 PM | Agence France Presse | Gaza City, Palestinian Territories: At least 50 Palestinians were wounded in a blast that occurred Thursday inside a militant training camp in Gaza, Hamas officials, medics and witnesses said. "An explosion happened inside a post of the resistance in Beit Lahya," said interior ministry spokesman Iyad al-Bozum, in reference to the Ezzedine al-Qassam Brigades, the military wing of Hamas. The health ministry spokesman in Gaza, Ashraf al-Qudra, said the blast wounded 50 people, five of them in a serious condition, and including children. Witnesses said the blast took place inside a training camp of the Ezzezdine al-Qassam Brigades in the northern Gaza Strip, where Hamas is the de facto power. A doctor in the Israeli-blockaded coastal enclave, Baker Abu Safia of Al-Awda Hospital, said 30 wounded people were brought to his establishment, most of them women and children. He said the hospital "declared a state of emergency" after the explosion took place. "inside a militant training camp in Gaza" refers to a terrorist facility, one of the many funded by foreign aid to Hamas, designed to produce with roughly equal passion dead Israelis and dead Arabs. Both serve the designs of the Hamas regime. "military wing of Hamas" falsely conveys the sense that there a non-military wing of the terrorist organization exists. Its charter is a public document. Though written in Arabic which many do not speak or read, English-language translations are widely available. Here's one. When it says "It is a brigade that must be reinforced by brigades upon brigades from this vast Islamic world, until the enemies are defeated and Allah's victory is revealed", those words do not define its so-called military wing, but define the essence of Hamas. "the blast wounded 50 people... including children" in a terrorist training camp. Children - alive and dead - are absolutely central to the Hamas concept of a fighting force. "30 wounded people were brought to [hospital], most of them women and children" is the most important sentence in the report. An explosion at a terrorist training facility and the victims brought to hospital are mainly women and children. Can this have happened in any military training facility in any other part of the world? If not, does this say something about the ethics and motivating drive that propels the terrorists of Hamas? In defending against them, should an army (Israel's for instance) regard them as a military force like any other? Or does it represent a remarkable, utterly different form of organized savagery, with all that that entails in terms of defensive military doctrine?